Those having played in U.S. tournaments will mostly certainly remember Cedric Thompson, a Milwaukee resident who was a very active organizer in the city. Less than one month after his last tournament, Cedric succumbed to an illness on August 12, 2002. He was 55 years of age. What stood out about Cedric was not only his massive height and size, but his apparent passion for chess. He received the baton from the tireless legend Pearle Mann and took the reigns of the city's playground chess program. He was also instrumental in maintaining the Milwaukee Municipal Chess Association and sat on the Board of Directors. 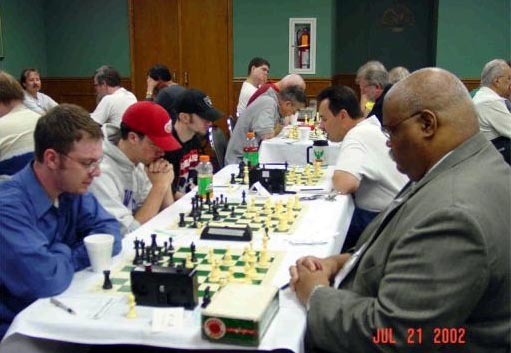 Despite spending most of his time as an organizer, Cedric was an adept player having achieved his highest rating of 2120 (Expert) in November 1992 and was listed as one of Wisconsin's top 100 players. At the Milwaukee chess website, The Chessmill," a candid story provides the reader with a glimpse of the type of person Cedric was. "Cedric was a man who loved Truth, and had no time for anything else. This thirst filled him and spilled over into his chess; at his last Western Open tournament we spent several hours searching for the truth in what at first looked like a simple pawn ending he had played earlier. We never arrived at it with certainty, but we made progress. Progress toward truth was never enough for him; he had to arrive, not simply journey. So, after we turned out the lights at the playing site, I knew he would continue to dig on his own. I don't know if he got to the truth of that position, but I know if he didn't, it was simply because he ran out of time." Cedric was survived by his beloved wife Sylvia Thompson, daughter Leah L. Thompson, brother Lawrence (Glenda) Thompson, Shirley Teal and Richard (Geneva) Thompson. Also survived by a host of other loving relatives and friends. Cedric Thompson (on right) playing Josiah Stein at the Green Bay Open.